The Delicate Mind/Naazuk Zein and SFI are teaming up to deliver Mind Matters Most, a one day workshop to provide support and resources to educate the Muslim community on mental health. Educate citizens and faith leaders about what mental health is. Topics to be covered: depression, self-harm, anxiety. Highlight that faith leaders can work together with each other and with mental health charities to tackle: the stigma of mental health, discrimination within their respective communities. 2) Show that a holistic approach required in order to tackle mental health. Through expiring the spiritual, psychological and physical aspects of mental health. Show that each person requires a different approach to tackle mental health. The workshop will show what good mental health is to help those suffering with a mental health condition to identify their condition. The aim of this will be to help participants identify their needs and promote the idea of self-help. Also highlight that the concept of jinn does exist, therefore show that spirituality is equally important as seeking professional medical help. 3) Successfully sign post individuals to services that work with faith leaders that help to tackle mental health issues within their respective communities. 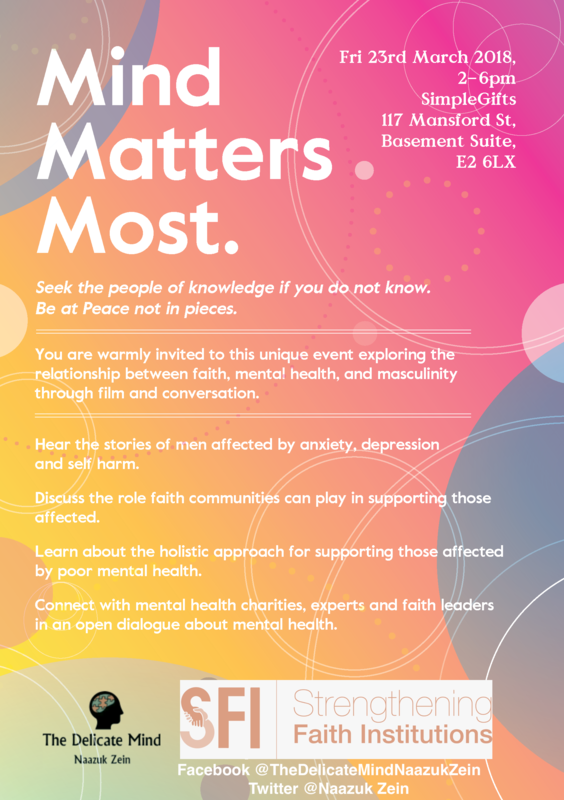 Promote the idea of social cohesion through highlighting that faith leaders from different backgrounds can work together to share their resources in order to tackle mental health. To register please, click here.